TOTU belongs to the same family of COMU and HOTU, which contains the best additive, OxymaPure®. 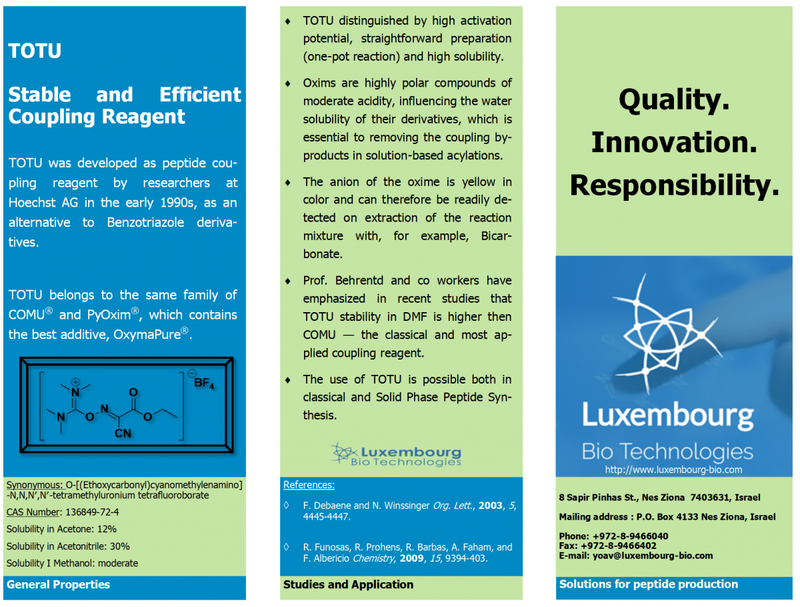 TOTU was developed as peptide coupling reagent by researchers at Hoechst AG in the early 1990s, as an alternative to benzotriazole derivatives. TOTU distinguished by its high activation potential, straightforward preparation (one-pot reaction) and high solubility. The only solvents used in the preparation are toluene and acetone. In addition, the sodium salt of the oxime employed in the reaction can be obtained directly from ethyl cyanoacetate. TOTU, HOTU, and COMU® are obtained as the O-form isomer (uronium salts), which is more reactive than the typical hydroxybenzotriazole N-form (aminium salts). The by-products resulting from the activation of a carboxyl group with TOTU are tetramethylurea and ethyl 2-hydroxyimino-2-cyanoacetate, which can readily be extracted in the water. Moreover, the anion of the oxime is yellow in color and can therefore be readily detected on extraction of the reaction mixture with, for example, bicarbonate. 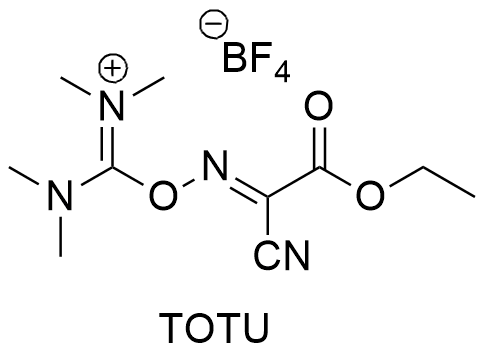 The use of TOTU is possible both in classical peptide synthesis and in solid-phase peptide synthesis. F, Debaene and N. Winssinger Org. Lett., 2003, Vol. 5, No. 23, 4445-4447. R. Subirós-Funosas, R. Prohens, R. Barbas, A. El-Faham, and F. Albericio Chemistry, 2009, 15(37), 9394-403.